My last day of diving arrived, and Junior was still too broken to dive, which was too bad. 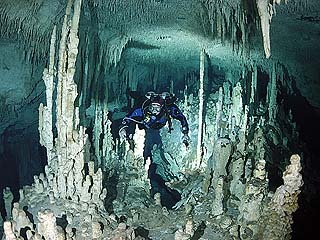 So I headed off to Gran Cenote to dive the famous Cuzanah Loop section of Sac Aktun. I love diving in this system, and managed to take some stunning pictures during my second dive here. Craig Brown (my good friend and Trimix Instructor) has talked about this wonderful dive for years and I was really looking forward to seeing it with my own eyes. The plan was to do one “long” dive today, so to be different, we decided to dive with stages for practice and to insure we had plenty of gas. This turned out to be unnecessary for this dive, but it was good practice and good fun. 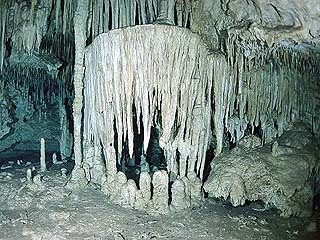 We entered the cave breathing from our back gas, and I had to remind my lovely cave guide to switch to our stage bottles after she finished running the primary reel. The decorations along this system are amazing and we swam slowly following the main line while gawking at all of the beautiful things mother nature had created. 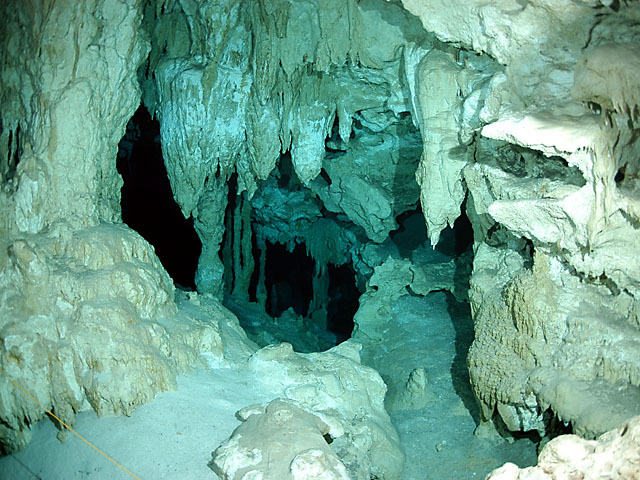 Eventually, we reached the end of the line, and I handed Bernie my Primary reel to make what was supposed to be a very long jump across the Ho-tul cenote. It turned out to be a very short jump, and we could have easily done it with any of our jump reels. We then passed a point in the line with an arrow pointing back to our exit, and two arrows pointing the direction we were going. We figured out later that this was the jump location to the end of the Cuzanah line, but we missed it this time and kept on swimming. 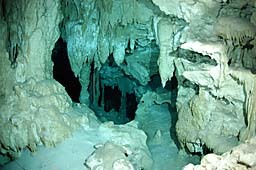 As we approached the Cuzanah cenote, we realized we’d missed our jump, but we had plenty of gas, so we decided to keep on swimming. The cave got much tighter as it went up and down, and negotiating the restrictions with an 80 CF stage bottle was entertaining. Several times I had to pull the bottle up tight to my stomach and rotate my body at an angle to negotiate the restrictions. About half way around the “loop”, I finally hit 2000 psi on my stage bottle, so we switched to our back gas and continued. We turned a corner, and rose up into the Cuzanah Room and, Wow! Double Wow! I think this is probably the most photographed section of cave in the world, and for good reason. I hovered in the crystal clear water and everywhere I looked I spotted amazing decorations. There were waterfalls, flowers, pillars, and soda straws among the delicate pieces of limestone. Across one wall was the very famous “Jaws” formation that looks like a giant set of teeth waiting to chew you up! I’ll bet we spent ten minutes just floating there, awe struck in the large Cuzanah room. It was silent except for our breathing, and I didn’t want to leave. Out came the wet notes as I wrote a note to myself, “Must bring camera back and photograph the Cuzanah Room!” Bernie indicated that it was very beautiful by passing her hand in front of her mask like she was wiping it off so she could see better. I had to agree! Eventually, we moved on, passing through a few more restrictions and reaching the end of the Cuzanah line. We could easily see the arrows on the main line where we should have connected our jump line earlier. Oops!! Oh well, we’d used only a tiny bit of our back gas, and the rules said we just had to go back through the Cuzanah Room. Now how tough was that decision to make? NOT! The other line proved to be pretty short, and pretty boring. At least I had a bit of challenging practice running the primary line in. The Cave line was up on the ceiling in very shallow water and my stage bottle was pulling my inflator down so I couldn’t vent very well at the tie off. I was laughing so hard my mask was leaking as I was momentarily pinned to the ceiling and reached for my rear dump as I juggled the primary reel, my stage bottle, my light and the difficult tie off. Oh well, that’s why we practice and train and dive. Experience is always the best teacher, and I definitely needed more. The green tannin was thick in this area and the water temperature was very warm. Bernie’s light petered out, so we had to call the dive, which was just as well, as there really wasn’t much to see. Once back to civilization, then Tani and I headed over to El Taqueria Fogor (try the Taco Loco or the Arrachera Especial) for our "last dinner". We were very sad to see our two weeks in Mexico come to an end, but I certainly felt very privileged to have been fortunate enough to not only receive some of the best Cave Diver training in the world, but also to get to see some of the most beautiful and stunningly decorated underwater caves in the world. We picked up our Cave cards and our Trimix Blender certs in the morning, and were told to, “ wire the money to our bank when you get home”. How’s that for trust? Scott hands us our cards, and our bill and we haven’t paid him a cent yet. Protec really does run an outstanding operation, and between the instructors there and the GUE boys, the two groups do the vast majority of the Cave and Technical training in the Riviera Maya. We said goodbye to our friends there, and headed back up North and back to our Jobs and Families. But you know, whenever some idiot cuts me off, or when I'm stuck in traffic, my mind drifts back to the beautiful and quiet places I’ve seen, and I day dream about the room of tears and smile. I’ll be back very, very soon!